PocketFivers dominated multiple final tables on Day 8 of 888poker's XL Blizzard. It was back to work on Monday for online grinders of 888poker’s winter tournament series, XL Blizzard. The schedule backed off just a bit from the massive Sunday lineup just one day prior and opted to simply offer a pair of tournaments. One for those on a budget who wanted to get in on the action and a larger Rebuy & Add-On event that drew plenty of mid-stakes grinders eager to accumulate leaderboard points and four-figure scores. The larger of the two tournaments of the day saw 414 players buy-in for $55 with 308 rebuys and 252 add-ons. The totality generated a $48,700 prize pool, exceeding the guarantee by $8,700 and promising eight of the nine final table players a four-figure payout. PocketFivers dominated the final table with the eventual winner being ‘yarik1903’, currently the #151-ranked player in the world. Having just recently surpassed $2 million in lifetime tournament scores, the Ukranian started his journey to $3 million by adding the first place prize of $9345.53, the largest XL Blizzard payout of the day. ‘yarik1903’ battled against Germany’s ‘hale_bop123’ , who finished as the runner-up cashing for $6,939.75. ‘hale_bop123’ may have been disappointed by not winning but he’s likely ecstatic by the score. The second place prize money is roughly $500 shy of his career high cash and his first four-figure cash since July 2017. Sweden’s ‘creutz93’ laddered and finished in fourth place for $3,896. The Swede is ranked #18 in his extremely competitive home country and is no stranger to final tables and big scores as this marks the eighth time he’s cashed for four-figures or more in 2018. Making an appearance in his third final table of the series was Swedish phenom ‘tutten7’ (aka ‘lena900’, the #3-ranked player in the world). ‘tutten7’ just came off a day where he earned a total of over $50,000 in XL Blizzard events #10 & #12. On Monday, he continued his series heater and finished in seventh place for an additional $2,069.75. 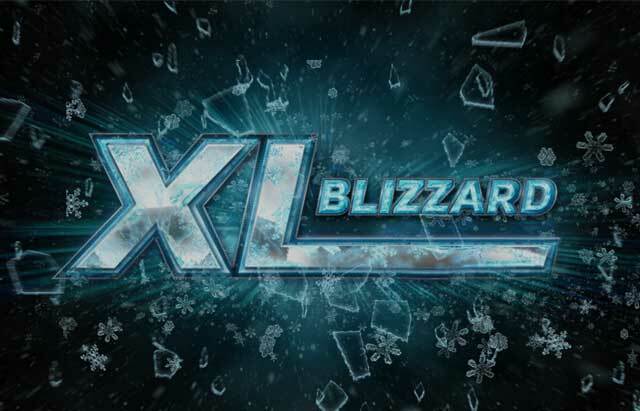 The combination of his scores has moved him into the top 10 of the XL Blizzard Leaderboard. Players came out in force to support the lowest buy-in tournament of the entire XL Blizzard series as 1,477 runners ponied up the $5 buy-in. With the low buy-in, players decided to rebuy early and often, rebuying 1638 times with 829 add-ons. With so much action, this prize pool exceeded the guarantee as well, ending up at $17,945.20. Russia’s ‘DeltaSpider’ and PocketFiver Igor ‘Agelesss1’ Selega from Ukraine brokered a two-way deal. ’DeltaSpider’ eventually finished in first for $2,618.41 while Selega settled for runner-up. Despite finishing in second, he cashed out for slightly more money at $2,676.23, making it the largest cash of his career to date. ‘luckypanch75’ finished in fourth place for $1,220.27, adding to his previous results and pushing him into second place on the XL Blizzard Leaderboard. He’s currently sitting right behind ‘Ao1ing’ who cashed yet again in Event #15, finishing in 15th for $122.02. While Event #15 was the lowest buy-in of the tournament, Tuesday is for the high-rollers and includes the gigantic $2,100 $250,000 guarantee High Roller tournament.